Once you have created your website, the next step is to get more traffic to it. In this article, we will show you a few ways you can promote and pull in visitors to your website. Your content is the most important part of your website and it needs to stand out from other websites offering same or similar content. Average, mediocre content is not good enough; you need is error-free, compelling content – content that will not only make you look more trustworthy and credible, but also go viral and get you quality backlinks. In fact, the success of all site-promotion tips and strategies rely on the quality of your content. If your website content is not unique, interesting or quality, visitors will not visit your website and/or share your content, it’s just that simple. Write about trending and controversial topics. Cover topics that are hot and trending. Use Google Trends to find topics that people are talking about and that have interest. If you are just starting out, you probably don’t have that many pages on your website. You probably won’t be updating those pages often either – it’s not very often that you have to update your About us or Contact us page. A blog is the best way to add new, original content on your website on a regular basis. Not only are you offering fresh content for your visitors, you are also adding more indexed pages to your website – that’s a cue for Google and search engines that your website is active. 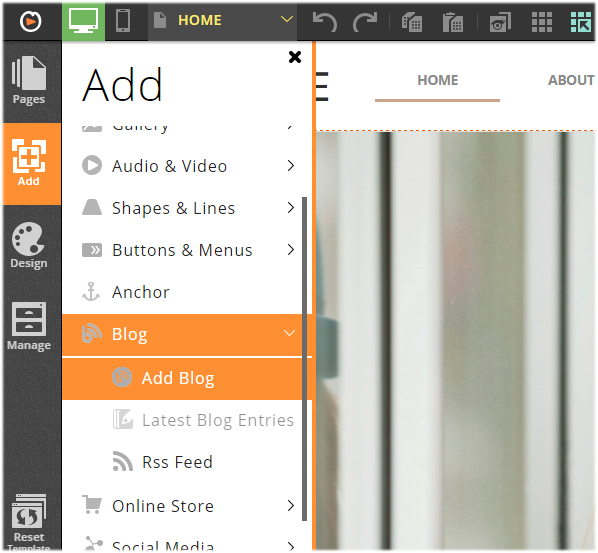 Your Website.com blog tool can be found from the Add menu in your editor. You are certainly not limited to writing for your own blog. Writing, or guest blogging, for other prominent blogs in your niche often yields even greater results. By including a link to your website, you can draw new visitors from a source that likely gets much more traffic than your own blog or website. Social media is the new word-of-mouth: it’s where people spend most of their online time, interacting with other people, sharing experiences and preferences. In other words, it allows consumers to communicate and share with a greater number of people than ever. Simply include social sharing buttons to your blog posts and you have just created content that people can share on their social networks. This helps expose your business to a broader range of audiences that you couldn’t have reach otherwise. 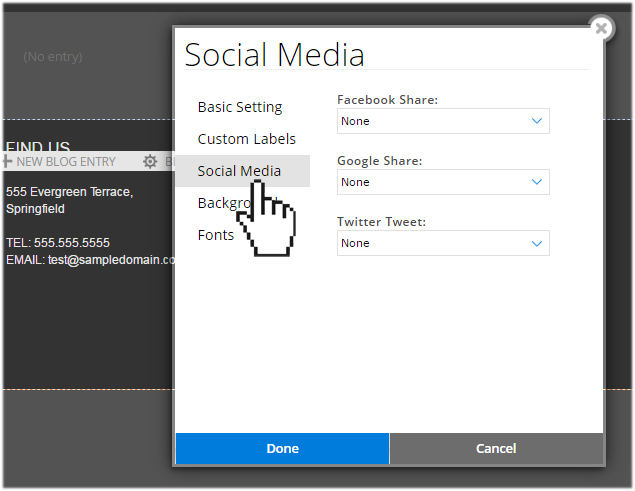 On your Website.com blog, simply click on the Blog Settings tool and you will find the social share buttons you can enable on your blog. 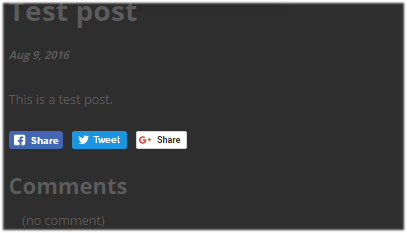 Once enabled, all blog posts you published will have the social sharing buttons for easy sharing. 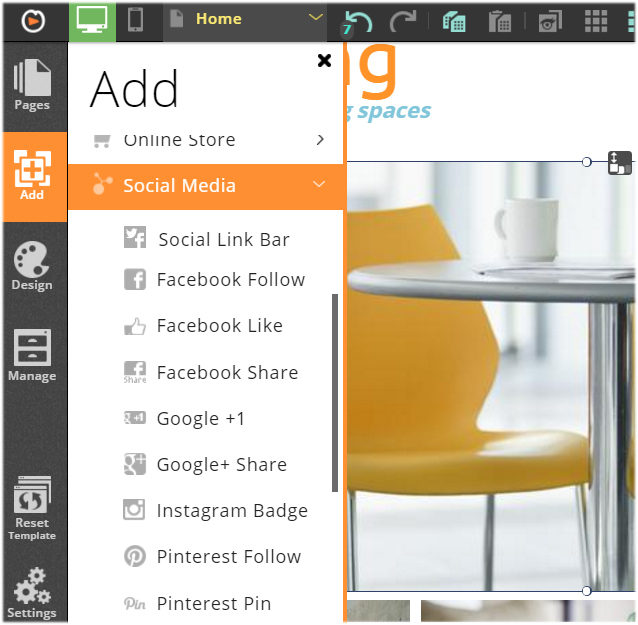 You can also add social sharing buttons to your website. Website.com lets you select from a variety of individual buttons or you can add multiple buttons via the Social Link Bar tool. Facebook has over a billion users connecting with friends, share links, photos, videos, and event, form and join groups and much more. One of the best ways to promote your website on Facebook is by creating a Facebook page. You can also post links to your blog or website, offer special deals, promotions and rewards to your Facebook fans. You can also use your Facebook page to interact with your customers: ask questions, post contests, conduct surveys, etc. You can also take advantage of Facebook’s paid promotion options. For example Facebook Ads lets you target people from a specific location, age, interests (ie. users who have liked certain Facebook pages, such as your competitors), and more. You can set a daily budget, pay for clicks or pay when people see your ad. Use Twitter to tweet interesting updates, news or facts about your business or products and provide a link to your website. You can also use Twitter to engage other businesses; for example, you can follow them, retweet their posts and comment on their tweets. LinkedIn is one of the world’s largest professional social network. In addition to creating a thorough profile of yourself or your business (and be sure to add a link to your website or blog) and updating your status, you can take advantage of relevant LinkedIn groups or groups that may be popular with your customers. This way, you can increase your visibility and become recognized as a trusted authority. If you can’t find a group that you want to join, you can always create one and take on a leadership role to start discussions on relevant topics. While Google+ lags behind Twitter and Facebook when it comes to the number of active users, it is still an important social media platform. You can create circles for your customers, vendors and others interested in your brand. You can also use Hangouts On Air (the multi-user chat and video tool in Google+) to create a short video that can be viewed in real-time or archived on your YouTube channel. You can share your images and videos on customizable boards. Simply add a Pin It button to your web pages so that your visitors can pin or post your images from your website to Pinterest. In addition to images, you can add the Pin It button to your blog posts and videos. An image can be more powerful than words, and with the click of a button, millions of people around the world can instantly view your photo thanks to the Instagram sharing feature in your Website.com editor. Did you know that YouTube is the second largest search engine on the Internet? YouTube has over a billion users and you can’t afford to lose out on this massive group of audience. Even a small number of views and shares can increase traffic to your website. And don’t forget, Google indexes YouTube content, making it easier for people to find and share your videos and your website. You can use pay-per-click (PPC) advertising to bring in traffic to your website from search engines like Google. Not sure how it works? In the simpliest terms, you pay a fixed price for every click your ad gets in the search engine. An example of a PPC program is Google AdWords. For more information on paid advertising, check out our article “Increase website traffic with paid advertising”. Email marketing is a great marketing tool because you are connecting with your customers on a more personal level – their email inbox. Setup an email newsletter subscription box on your website using our MailChimp-integrated tool. Next, give visitors a compelling reason to subscribe; then send great content regularly so they don’t unsubscribe. Use email newsletters to encourage your subscribers to return to your website on a regular basis, whether it be new product, blog posts, videos, promotional specials, etc.